The cabinet of ministers on a proposal made by Mr. Kumara Welgama, Minister of Transport, gave its approval to amend Section 157 A( 4) of the Motor Traffic Act, to impose spot fines against drivers and passengers traveling in the front seat of vehicles contravening the seat belt Regulations. ·In keeping with the provisions of the Motor Traffic Act, Regulations pertaining to violation of seat belt provide, on conviction, after a summary trial in a Court of Law, for the imposition of a fine not less than Rs.1000/- and not exceeding Rs.2000/- on the first occasion, a fine not less Rs.2000/- and not exceeding Rs.3000/- on the second occasion, and a fine not exceeding Rs.3, 500/- and cancellation of the driving license on the third occasion, on conviction after a summary trial in a Court of Law. “Implementation of these fines is being carried out by the courts and the public have been inconvenienced” Transport minister Welgama said urging the need to to amend the Law to impose spot fines. What happens when a parent taking his child who is not fit enough to wear the seat belt? Yes good system for safety requirment taiting,also parents should responsable for their childs safety! I have seen parents in the front seat, with a young child moving about playing on the lap. 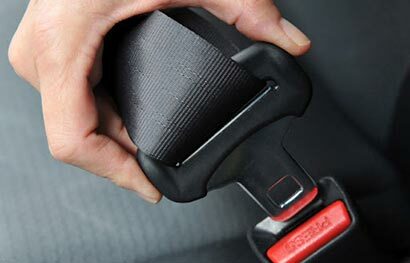 Do the foolish parents think of the safety of the child in the event of an accident or even emergeny braking? The child would fly through the windscreen like a missile at the speed of the car, resulting in the child’s instant death. The front seat passenger would also be injured, if not wearing a seat belt. Hence, it is timkly that this law is enforced now by spot fines. But corrupt policemen would pocket a lesser charge and wave the driver off, without a fine! Who is to weed out the corrupt cops? As for Damian’s query, the answer is simple. All cildren below 12 years are not allowed to travel in the front seat. All children who travel in the rear seats have to sit on a ‘child seat’ which is anchored to the rear seat, and has its own safety harness. This should be made compulsory as in developed countries. Children between 8 and 10 yrs have to sit on ‘booster seat’ which is anchored to the rear seat, and wear special safety harness which comes with the booster seat. These seats have to be imported from abroad or manufactured in SL by an enterprising company, easily. Motor Traffic Act should be ammended to include these laws and enforced by spot fines, for the safety of the child. There should also be laws against children riding on motorbikes wedged between the parents, not wearing safety helmet. Infact, no child should be riding on motorbikes at all, as it is highly dangerous! Where is your common sence my friend. What do you mean not fit enough to wear a seat belt. If you mean not old enough then it is the parents responsibilty. These laws have been put in place not because the GOSL wants to annoy the people. THese are in place for the safety of the people. If you read ND,s article you would have got all the answers to your questions. I think we should b happy that we are geading in the right direction. With the raods getting better cars are starting to travel at higher speed and the fatality of accidents are graeter. Let us look at this problem of the childreen in the front seats in a more Sri Lankan aspect. We the majority of us are a closely knit family bonded unit.Our children (rightly or wrongly over attached to their parents and hence cannot be coaxed to take a back seat.Even the mother seated in the box seat would not be happy about her young darling being pushed into back seat.I suggest that the child also be seated in the box seat and strapped together along with the senior passenger.I think the necessary protection is achieved this way. As for fears of ND about he Policemen resorting to corrupt practices it is overcome by the payment of the fine at the nearest Post Office.If it is after Post Office hours is the problem then you will have to pay on a subsequent day and collect your confiscated DL from the Police Station concerned. That is a real punishment. I think Srilankans are much more intelligent not to realise that family unity or bonding has nothing to do with road rules which are in place for their safety.I think the reason the kids won’t sit in the back seat is beacuase unfortunately most young kids are spoilt brats in SL now. Parents are too busy or too tired to descipline their kids so they let hem have their own way. What happened to the nice obidient well brought up generation we had. It is sad that but I have niticed that most young families have no rules or discipline in place for the kids.